2. Selecting and loading OSM points. Points can be a variety of features (buildings, shops, amenities), below are all the points from the Leicester area, all 13,823 of them. What if we wanted to select one particular type of point? 3. By using the relevant search expression we can identify those points which are identified as amenities – in this case, it’s pubs. Through the editing tools I have also added a point of my own specification (the light blue one). This is the event site I am particularly interested in looking at (roughly the middle of Humberstone Gate). 4. 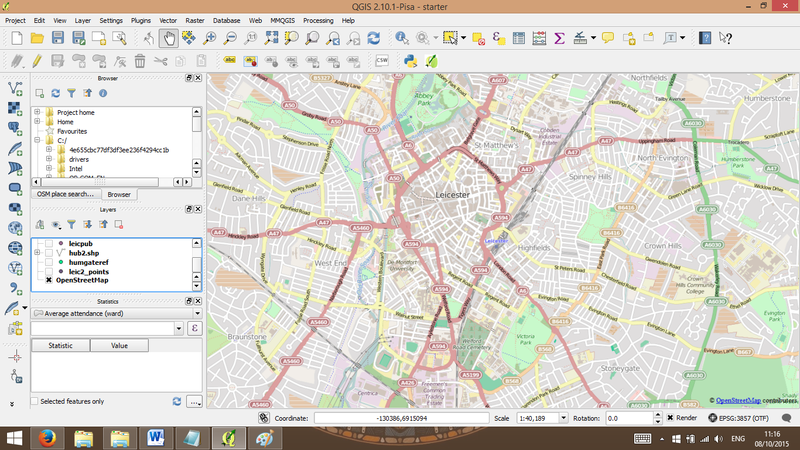 The following shows the inclusion of lines from OSM – mostly roads. Each line has its own variables which can cover speed limits, pedestrianization and one-way restrictions. 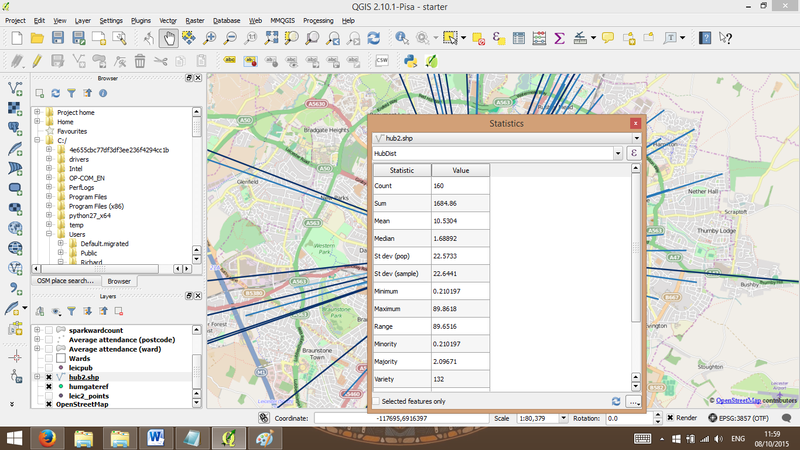 This layer is essential to carrying out route analysis. 5. 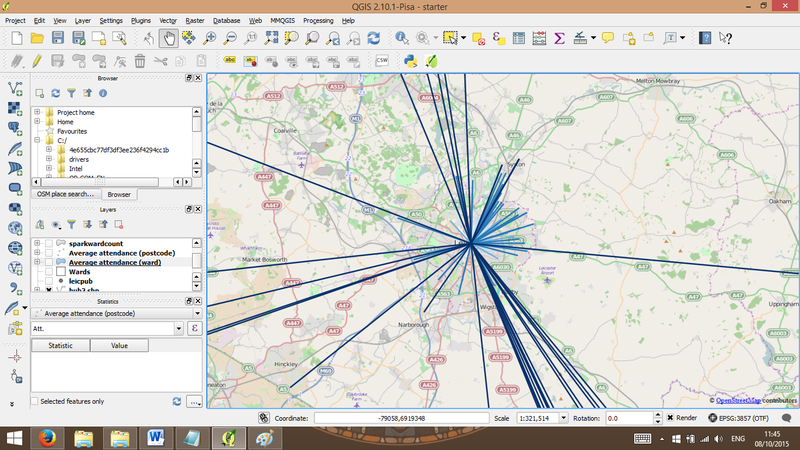 Zooming out a bit further now, we have geocoded (turned into co-ordinates) a small set of postcodes of attendees. We have imported additional data from this audience survey which in this case refers to how many previous times they have attended the event. This data has been used to colour code the points, with darker points representing more frequent attendance. 6. 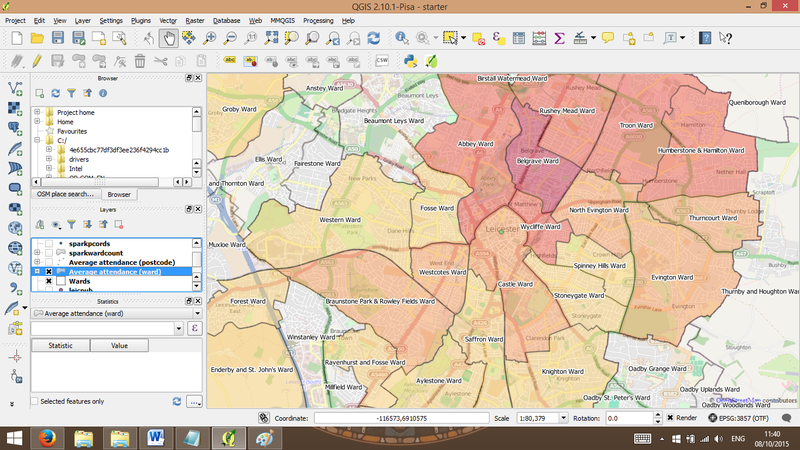 We have added Ordnance Survey OpenData below, specifically the polygon layer designating wards. Numerous other administrative boundaries are also available though ward level is one of the more suitable for urban environments. 7. 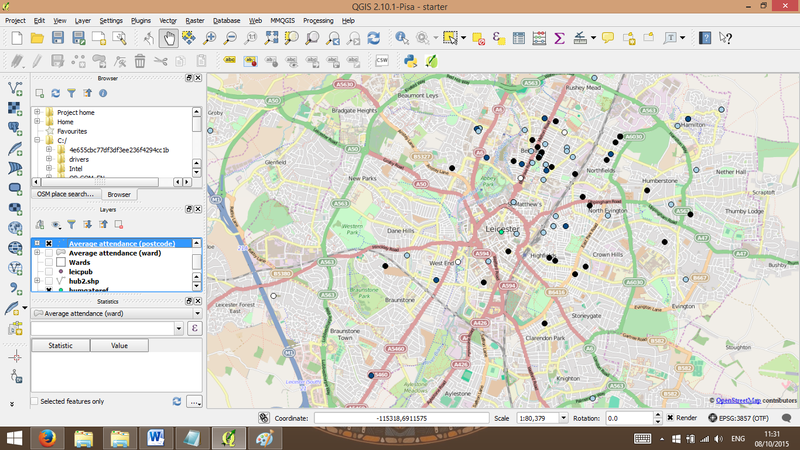 Now we have cross-referenced and colour coded the original postcode/co-ordinate data onto the ward level polygons; and used the previous attendance variables to weight appropriately. 8. A similar example shows a hub diagram from the event site and the spokes to individual attendees. In this case (and zooming out further) the darker the line, the further straight-line distance traveled to our original point. 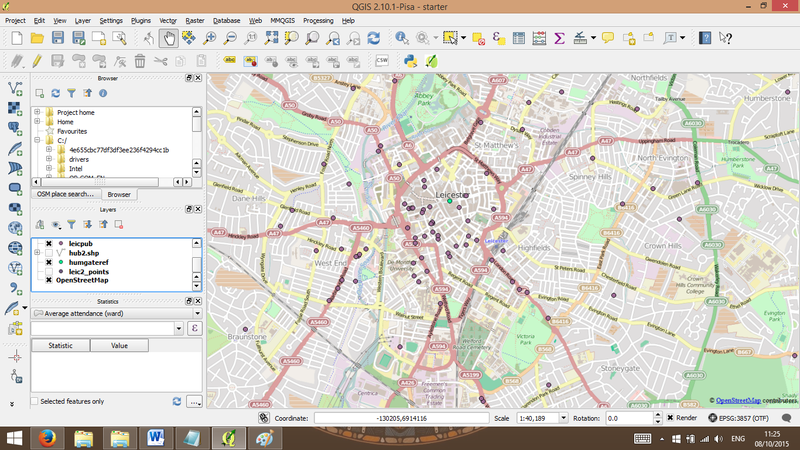 This particular diagram makes use of an additional plug-in (MMQGIS) which is also capable of Voronoi diagrams and some basic animation. 9. 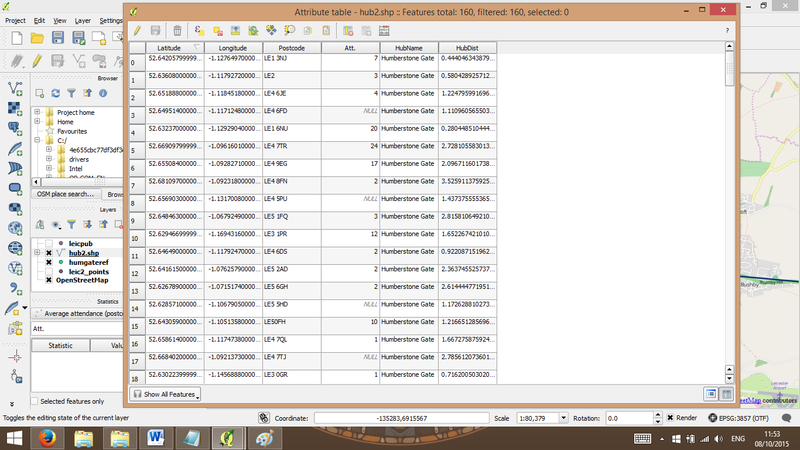 The attribute table for each layer contains the raw data behind the visuals. 10. The Statistics panel provides quick summary statistics (averages, std dev, range) of the whole data set – or of individual points or groups when selected. 11. 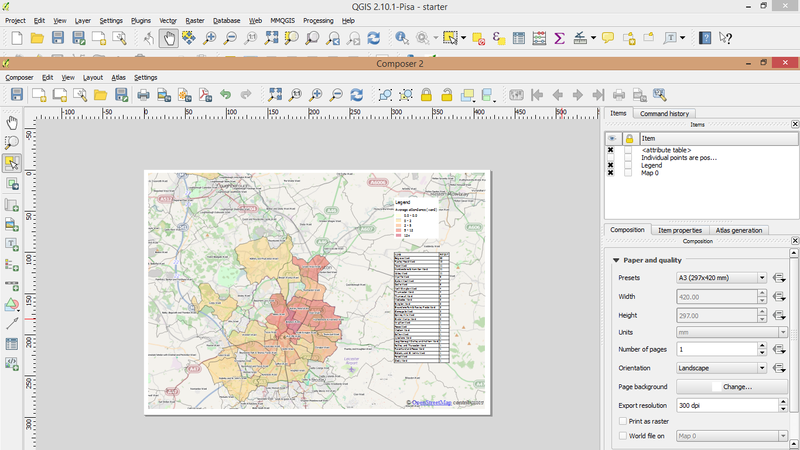 Finally, Print Composer prepares the map for printing, adding legends and attribute tables. I haven’t investigated fully yet, but the map can also be published online as a fully interactive ‘browseable’ html object (plugin: qgis2leaf). 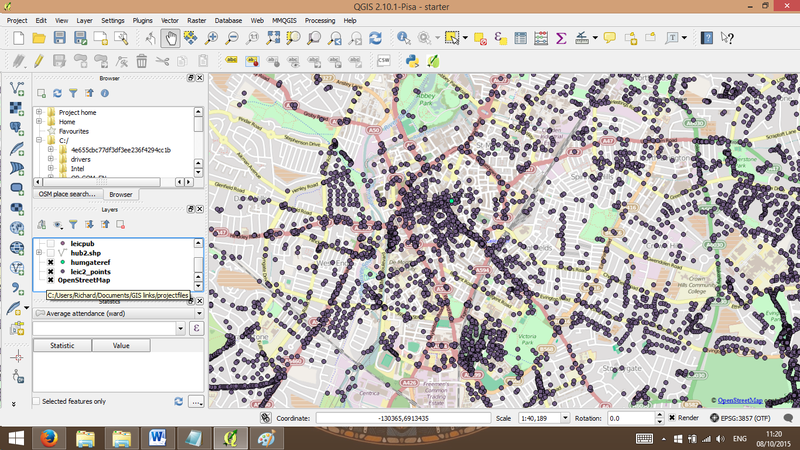 What further use can QGIS have for events and festivals research? There are many other data sources that could be integrated and cross-analysed, whether indices of multiple deprivation, more detailed housing data (population densities?) 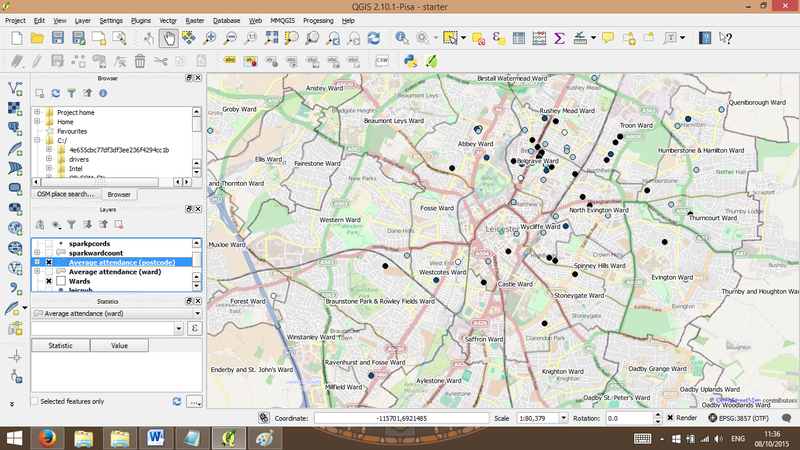 or the location of key venues around the city. The Diversity of Leicester report from back in 2008 had some interesting mapping of religions, wonder what it looks like now? The realm of ‘DIY’ geo-demographic segmentation is very interesting indeed. I particularly find the work of Open Geodemographics interesting; given that a big chunk of commercial segmentation methods are drawn from freely available data sources like the National Census. ….Assuming you agree with some of the ideas of segmentation at all that is! Undoubtedly it can be a fast and effective (and pragmatic) research tool, simply requiring a handful of postcodes and a small degree of interpretation of the results afterwards. How much can you assume about someone from a postcode? What if you feel the assumptions and categories are simply not right for you? Even arts/sports/culture based segmentation like Audience Finder can only ask so many questions that are relevant across most (all?) organizations, there will always be unique and new areas of interest. 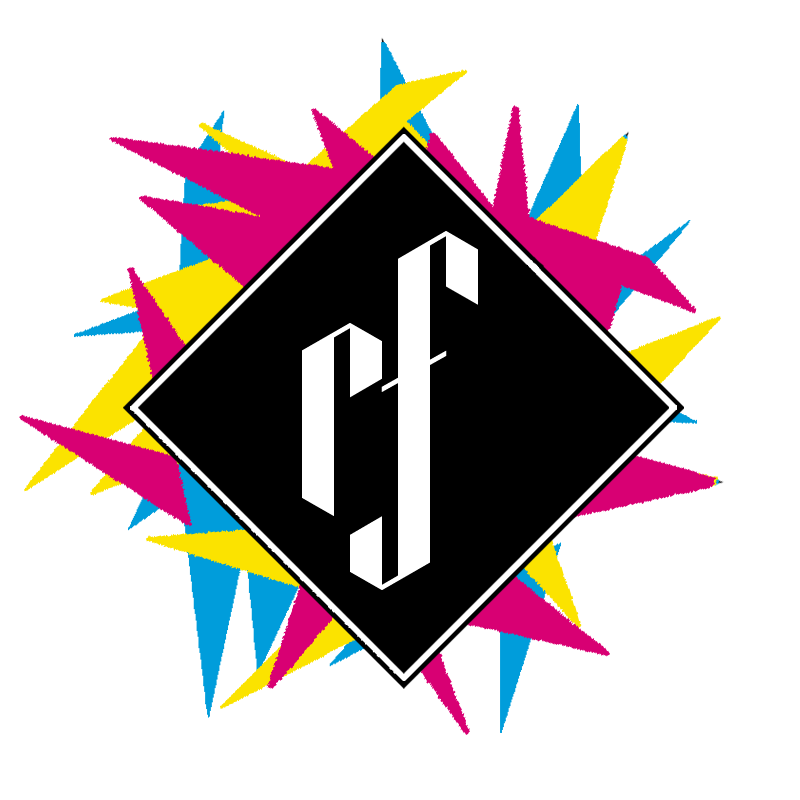 My current work with Leicester Arts Festivals will build up a coherent data set covering (potentially) 30 or so member festivals and I’m looking forward to ‘playing around’ with that when the time comes. It could be possible to compare their attendees with those of key ‘permanent’ venues to further question whether festivals really attract ‘new’ audiences. There is a strong theme of collaboration so finding ways to co-operatively reach (steal? borrow?) each others audiences will be really interesting.